Story: Nothing has really been revealed about Spindle Six. He fought the B.T.L. and was supposed to be the sixth Foot Soldier . He did work with the Foot Soldiers, calling himself the Spokesman, but he did not join the Foot Soldiers . 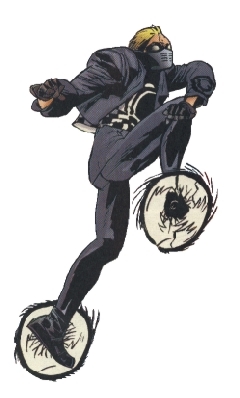 Equipment: Spindle Six wears a pair of boots with wheels giving him speed and apparently some enhanced agility.